For as long as I can remember, Peter Hyams has been one of my all-time favorite writer and directors. Though you've certainly heard of many of his films, and more than likely seen and loved them, most people don't know the name of the man responsible for making them as good as they are. And most are unaware that the guy also wrote those films himself. For a guy who's given the world such classics such as Outland, 2010, Running Scared, Stay Tuned, Narrow Margin, Timecop, Sudden Death and even smaller films like The Presidio and The Relic, it's a travesty that his name isn't already in our consciousness and considered one of the best filmmakers on the planet. But alas, that's where we're at and it's such a shame. But before he would deliver some truly amazing classics, Hyams got his start directing in the early 70's with TV films, before transitioning to the big screen with this action/comedy/thriller from 1974, which he also wrote, making this his first solo writing and directing gig for a feature film. 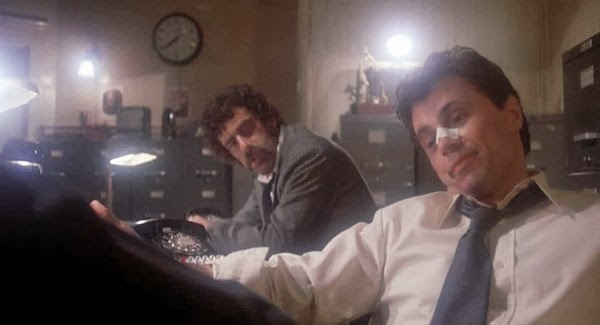 Robert Blake and Elliott Gould star as two L.A. undercover cops who routinely bust prostitutes and their Johns. When one of their busts ties back to a local drug kingpin, they get in way over their heads, despite repeated orders from their superiors to back off. This was right before Blake would hit it big in his most famous role, that of Det. Tony Baretta in the hit series Baretta from 1075-1978. But then of course, we all know why he became ultra famous after that. But that's another story. Gould was busy this year, having made a total of 4 different films. The guy has acted in almost 200 different roles, but he'll always be Ross and Monica Geller's father on Friends to me. But here they play the roles of the cop/buddy effectively well in a way that foreshadows the formula that writer Shane Black perfected with films like Lethal Weapon, The Last Boy Scout and even The Nice Guys. That formula has always been around, but it wasn't until Black's Lethal Weapon that it was perfected in a way we hadn't seen before. But you can see a lot of that here in this film. In fact, it's so evident that there's no doubt in my mind that Shane Black has seen this film. It reminds me a lot of his what he did with The Nice Guys, and even some of his earlier films. Hyams would perfect this formula himself personally with his 80's action/comedy/thriller classic Running Scared in 1986, a film that continues to be one of the best and most shining examples of this type of film, and a highlight in writer/director Peter Hyams filmography. As far as Busting goes, I enjoyed it a lot, but I didn't love it. This could be because it feels like he's still trying to find his "style", and it sometimes struggles to find it's rhythm. The film looks great, and you see moments where he's coming into his own here, but not quite hitting the mark 100%. As a result, the pace and structure also become a bit uneven. The film never feels like it's moving towards a big climax, rather it shifts in tone throughout, sometimes feeling like it takes a few steps back instead of forward. Despite it's pacing issues, the film packs a visual punch. The grittiness of early 70's LA is on full display in such a glorious way, with Kino Lorber's stunning new transfer bringing it all to exquisite life. There were so many moments that reminded me why I love how films of the 70's were made. Like for example in the night sequences where our hero cops are running through the city chasing a bad guy and that very specific way a street light used to be captured through a camera, illuminating the screen with a large soft white halo around each light source. I remember it vividly in Superman: The Movie (1978) and that very same effect is perfectly captured here in stunning clarity. Hyams was also perfecting his directing skills here. While not quite up there with his best work in later years, you can clearly see his talent here. No doubt. For the first time in any of his films, he utilizes a whole lot of tracking shots, some in such a unique way that I hadn't ever seen before, or since. And still, his direction here is leaps and bounds better than most films of this period, and most importantly, this genre. He's one of the best directors on the planet, and this film, if anything, serves as an early reminder of that. He wouldn't go on to become his own cinematographer until 1984's Outland, which as you know is a huge rarity in the field when the director also serves as his own Director of Photography. Hyams was the best in more ways than most people will ever know or be aware of. 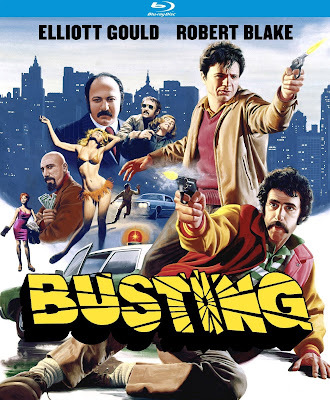 The performances are strong throughout, with Robert Blake sort of coasting through here in a very understated performance, while Elliott Gould does a far more memorable turn as a schlubby, messy cop who doesn't seem to care for his own personal appearance, but does a helluva job as a cop who doesn't hide from his personal convictions. We also get a few memorable supporting bit parts from Rob Zombie mainstay Sid Haig (here as a bouncer/bodyguard), the legendary Antonio Fargas (I'm Gonna Git You Sucka! ), Allen Garfield (Beverly Hills Cop II) and Michael Lerner (Maniac Cop 2). Despite a lack of subtitle options and any real special features, the commentary is worth a listen. Hyams is informative, while Gould and Morgan keep it lively and fresh. And I can't stress enough how impressive the transfer is on this. Combining the vibrant colors of the 70's with this HD presentation is gorgeous in a stunning color palette of greens, oranges, yellows and red's. 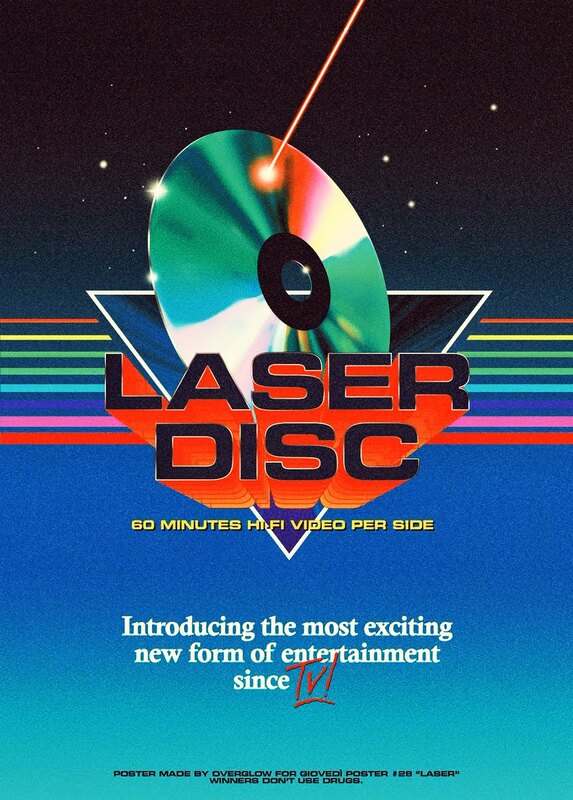 Kino Lorber has been steadily making a name for themselves in the Blu-Ray market, oftentimes getting their hands on rare titles before other, more popular, releasing companies. And it's because of companies like Kino that I have hope for some of my all-time favorite undiscovered and under the radar gems (some of which have never even gotten a DVD release before) getting the official Blu-Ray treatment for the first time. One can only hope.